Former slave Frederick Douglass once said that “education . . . means emancipation. It means light and liberty. It means the uplifting of the soul of man into the glorious light of truth, the light by which men can only be made free.” Perhaps Joel Klein would also like to sneer that Douglass also had just an 1860s mind unsuitable for the 21st Century? No, I didn’t think so. THAT would play poorly in urban and suburban districts where Amplify and At&T hope to sell those new Tablets to be a visual replacement for emancipatory type knowledge within a students own mind. Such a lousy investment for taxpayers to be funding the known, intended, destruction of the Axemaker Mind. 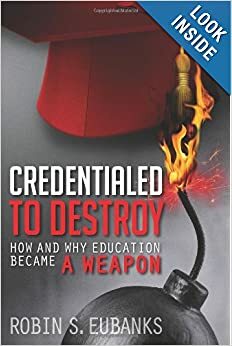 http://www.invisibleserfscollar.com/blending-sustainability-and-education-to-gain-arational-nonlinear-minds-and-new-behaviors/ is where I originally explained the significance of destroying the Axemaker Mind and where the now beloved metaphor actually comes from. The point is that the transformative education being mandated for both K-12 and higher ed under obscuring but appealing names like College and Career Ready, 21st Century Skills, Lumina Diploma Qualifications Profile, the Common Core, Deep Learning for Understanding, Quality Learning, etc are none of them a Frederick Douglass type of emancipatory education. That would be too individualistic and might nurture a desire to pursue self-interest instead of communitarian values. Right because the only people entitled in 21st Century America or anywhere else in the West should be politicians and their cronies enjoying the coercive powers of government to take OPM, Other People’s Money, and reward it to their allies. Here’s the problem. You only get that one time confiscation of wealth to fuel the allies. Stalin got to use Collectivization to fuel Industrialization in the USSR but at the cost of the Soviet Union never having a viable agricultural sector again. From food exporter of grain to importer to avoid starvation. He destroyed incentives and necessary knowledge and skills in addition to all those lives. It takes real individual knowledge in the Frederick Douglass sense and genuine personal skills of marketable value in the Julian Simon sense http://www.invisibleserfscollar.com/learning-to-learn-or-how-to-replace-old-minds-with-sustainable-new-ones/ plus hard work and a willingness to take risk to create wealth in a society. New products or services that people want to buy. A job is not wealth if the money to finance it was confiscated from someone actually trying to create Wealth. The kind of Prosperity that raises all living standards. The Economic Pie is not stable and fixed and available for redistribution to political allies without affecting its size. In the Lumina world of Equity in Credentials by stressing group learning and social and emotional learning and interpersonal skills, we are creating expectations at great expense without any real means of cashing them in. Contrary to the political slogans, a living wage in return for being human and drawing a breath is not a promise any government can keep long term. They can get to power that way (see Argentina) but when the wealth and knowledge are gone and incentives are destroyed, countries and civilizations can and do go into death spirals. Then most are dependent with a vacuous Newmindedness and there will not be enough Axemaker Minds to get the economy back on track. Looking at the faces in the crowd on Tuesday night, America’s Election Night, and spending part of yesterday eyeing the makeup of the electoral coalitions, I can tell you there are a huge number of Americans who voted for both Presidential candidates who are not OK with destroying the Axemaker Mind and manipulating values away from what made America great. They are also not OK with the Corporatist/Dirigiste vision of the economy where political insiders and their cronies benefit and no one else. In reality the rest of us are to get the kind of servitude and assigned roles that Frederick Douglass thought the US Civil War was fought to stop once and for all. Blacks, Whites, Hispanics, Immigrants, Middle Westerners, Suburbs. Our next generation of voters is under organized attack through education. To literally have their “hearts and minds” captured in the classroom over the years of imposed attendance to accept John Dewey’s idea of democracy. When he wrote that vision in 1916, no one fully appreciated the costs. But now we do know, but every reformer keeps coming back to Dewey anyway out of a desire to control individual behavior and have a politically directed economy. I spent part of yesterday mulling over the fact that nothing now could stop the vision I have been profiling. And how few would support it if its long term consequences were actually understood. So I dug back into the school resegregation treatises which is where Regionalism and the 1990s ed reform attempt went to regroup after Al Gore lost the Presidency. Apparently there was a 2002 Chapel Hill conference. In the book that resulted laying out the blueprint for the future, john a powell, who was a featured speaker at President Obama’s Building One America conference in 2011 that I wrote about here http://www.invisibleserfscollar.com/distributive-justice-is-not-enough-we-must-break-the-illusion-of-the-unitary-self/ lays out his vision for true integration. It basically marries communitarianism with Regionalism. It envisions more than breaking the unitary self. Trashing of the entirety of Western culture up to now is more the ambition of this very influential man with access to political levers and coffers at the highest levels. “[T]rue integration requires community-wide efforts to dismantle that culture and to create a more inclusive educational system and a more inclusive society in which all individuals and groups have real, equal opportunities to build and participate in the democratic process. True integration in our schools, then, is transformative rather than assimilative. That is, while desegregation assimilates minorities into the mainstream, true integration transforms the mainstream. . . it recognizes that cultures are not static but are constantly evolving and that all students benefit from a truly equal and just system of education. Accountability in that quote has the same purpose we have seen with its use in accreditation. Compliance with this political vision. A very communitarian agenda. Now you know once again why ICLEI and Agenda 21 are never far away from what is now called Metropolitanism. http://www.invisibleserfscollar.com/protected-producers-vs-paying-consumerstaxpayerswho-will-prevail-on-education-and-the-economy/ is the current vision as of a few weeks ago featured at a breakfast to promote Regionalism worldwide. No wonder you had such high turnout Tuesday in urban areas. What an opportunity for power at our expense! In this world people rarely get a crystal ball that actually is reliably prophetic. I am afraid blueprints of intended political actions once power is achieved are as close as we humans can get to seeing the future. We have that. If we couple those blueprints with a knowledge of history and economics, we actually can foresee the impending tragedy. And it is incumbent on all of us to spread that knowledge and build up a real multiracial and multiethnic coalition around our genuine common interest in averting the disaster that will accompany using education to “reconfigure our collective understanding and political will” around either John Dewey’s political vision or john a powell’s. We did find out in time what the Second Term is putting in place. There will be a Second Term now so let’s begin to build a more widespread appreciation for what this entails. And how unacceptable it effects are likely to be for most of us not living at taxpayer expense. Get up everyone! Throw off your funk or illusions. Whichever is apt. Time to Avert an Impending Catastrophe. Before the Collapse if Possible.